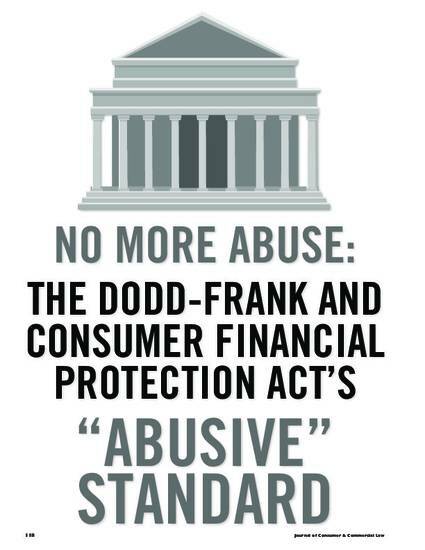 The Dodd-Frank Wall Street Reform and Consumer Financial Protection Act creates the new Bureau of Consumer Financial Protection. This consumer watchdog will be responsible for the most powerful consumer protections in American history. Under section 1031(d) of the Act, the Bureau may ban acts and practices that are unfair, deceptive, or abusive. While the unfair and deceptive standards have existed for some time, “abusive” is a relatively new legal standard with limited jurisprudential history. Thus, ironically, critics assert that the inclusion of the abusive standard is itself an abuse of legislative power. This Article asserts that despite some criticism to the contrary, the term “abusive practices” is not unduly vague. By analogy to past application of the same term in other statutes, we can confidently say that it applies to at least three things, and the development of regulation of those three will then allow the term to be better understood and manageable.